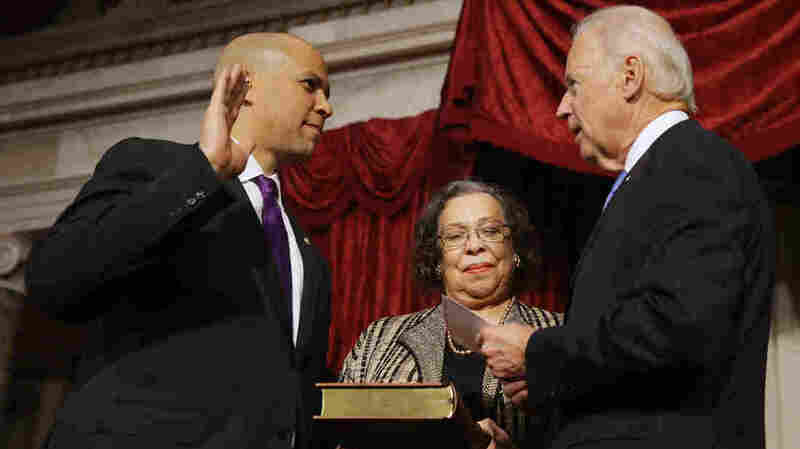 Booker Brings Dash Of Diversity To Still Old, White Senate : It's All Politics Former Newark Mayor Cory Booker, 44, was sworn in Thursday, becoming the second African-American in the U.S. Senate and only the fourth ever elected to the upper chamber. He also brings youth to the Senate, where the average age is 62. Vice President Joe Biden swears in Sen. Cory Booker (D-NJ) as his mother, Carolyn, holds a Bible on Thursday. Cory Booker is a Yale-educated lawyer and erstwhile tweeter who, as mayor of Newark, N.J., displayed a knack for grabbing headlines while building a mixed legacy as the troubled city's leader. He's also black, and Thursday at noon the 44-year-old Democrat was sworn in as a U.S. senator, making Congress's upper chamber just a tiny bit more diverse in more ways than one. Booker, who on Oct. 16 was elected as New Jersey's first black senator, will join Republican Sen. Tim Scott of South Carolina as the chamber's only black senators. Scott, a former congressman, was appointed to temporarily fill retired Sen. Jim DeMint's unexpired term and is running in 2014 for the right to serve out the term's final two years. The last elected black senator? That would be Barack Obama of Illinois, back in 2004. Obama and Booker form half of an elite group: Only four African-Americans have ever been elected to the U.S. Senate and served. Five, including Scott, were appointed. As Booker starts his Senate career we thought we'd take a quick dive into the demographics of our Congress. We have drawn on the detailed work the Congressional Research Service does profiling each successive Congress — including the current 113th. In her analysis of the 113th, Jennifer Manning of the CRS reported that the average age of members "is among the highest of any Congress in recent U.S. history." That means Booker, born in 1969, will bring a dash of youthful diversity to the Senate, where the average age is 62. He replaces the man who had been the oldest serving senator — New Jersey Democrat Frank Lautenberg, who died in June at 89. But the average age is going down. Manning reports that the average for senators elected in 2012 was 53, down from 57.1 in 2008. The U.S. House is younger, but not by much: The average current age is 57; the average age of those elected last year was 49.2 years. The oldest senator in U.S. history was Strom Thurmond, the South Carolina senator who was 99 years old when he stepped down in January 2003. Thurmond, who died six months later at age 100, was also the longest-serving senator, chalking up nearly a half century. The distinction of being the dean of senators, age-wise, now goes to Democrat Dianne Feinstein of California, who is 80. The youngest? Sen. Christopher Murphy, D-Conn., who was born in 1973. The oldest House member is Rep. Ralph Hall, R-Texas, who was born in 1923; the youngest is Rep. Patrick Murphy, D-Fla., who was born 50 years later. With Booker sworn in, joining fellow New Jersey Sen. Robert Menendez, the Garden State becomes the first in the nation to have an African-American and Hispanic serving in the U.S. Senate at the same time. A milestone, to be sure. Booker also joins Obama, and former senators Carol Moseley Braun, an Illinois Democrat, and Edward William Brooke, a Massachusetts Republican, as the nation's only elected black senators. But Senate diversity remains more a tale of women than ethnicity. There are 20 female senators, 16 Democrats and four Republicans. The real diversity story is playing out on the Democratic side of the aisle in the U.S. House. There, Manning of the CRS reports, women and minority representatives are a caucus majority. Eighty-two women serve in the House, 62 of them Democrats, and 20 Republicans. CRS reports that there are 43 black House members, including two delegates, all Democrats; and 34 Hispanic/Latino members, including a delegate and Puerto Rican resident commissioner, of which 27 are Democrats. Twelve House Democrats are Asian or Pacific Islanders. Jeanette Rankin of Montana was the first woman elected to the U.S House, back in 1917. It's worth noting that it wasn't until 1920 that the 19th Amendment gave women the right to vote — and that was a year after Rankin's term ended, reports R. Eric Peterson, a specialist in American government at CRS. Over on the Senate side, the first woman to serve was Rebecca Latimer Felton of Georgia, appointed in 1922 after the death of her senator husband. The House, Peterson reports, was 95 percent male until the 102nd Congress of 1991-1992. In the succeeding decade, the percentage of women in both the House and the Senate grew at its historically highest rate, he says. In his analysis of congresses dating back to 1945, Peterson found that law was consistently the most commonly reported occupation or professional background of U.S. senators. "Lawyers have occupied between one-third and half of Senate seats in each Congress studied since 1945," he reported, with the peak in 1971-1973 of more than half. Business and banking were reported as the second most common occupations among senators since 1945. House members reported much more diverse occupational backgrounds, though law was the most commonly cited over time, Peterson found. Booker worked as a staff attorney for the Urban Justice Center in Newark, but quickly jumped into his political career, winning a seat on the city council in 1998. An earlier version of this post said Rep. Ralph Hall, R-Texas, was born in 1933. He was born in 1923.